AHIN-SIF-00949 Fougerolles-du-Plessis 53190 Loire Valley Detached Maison de Maître within easy walking distance of a sought after village. Superb walled garden. The house is built in the Maison de Maître style with accommodation over 3 floors and light and airy rooms. The property benefits from oil fired central heating, centralised mechanical ventilation and wood framed double glazed windows with shutters. It was renovated between 1995 and 1998. Viewing is highly recommended. The property is situated in a village where you will find an award winning boulangerie, a butcher, a post office, a bank, a supermarket with petrol station, 2 bars, a restaurant, a hairdresser and 2 brocante/second hand shops. A market is held in the village square on Friday mornings. The town of Fougeres is just 20 minutes away, and has the largest medieval château in Europe. It has many good shops, cinema and ten pin bowling. Just outside the town is the Forest of Fougeres, which has a large lake and beach. There is also horse riding in the Forest. The property has excellent transport links to the UK via the ferry ports at Calais - 4.5 hours, St Malo - 1.5 hours, Le Havre - 2.5 hours, Cherbourg - 2 hours. The airports at Rennes and Dinard are about a 1 hr 30mins drive away. 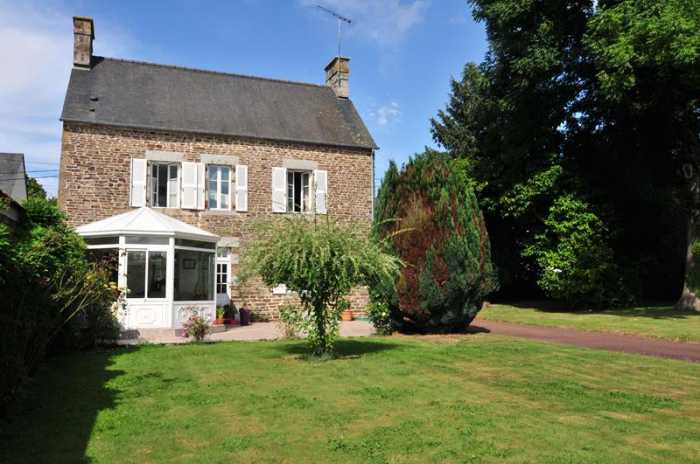 The house is situated in the Pays de La Loire but travel five minutes and you can be in Normandy or Brittany. Fougeres, with its ancient belfry, many shops, bars and restaurants is 20 minutes away. The medieval town of Domfront is 30 minutes away. The UNESCO heritage site of Mont St Michel is less than an hour away. The towns of Gorron, Ernee and Mayenne are close by. The market town of St Hilaire du Harcouët is approx 15 minutes away. Kitchen/Dining Room 5.93 x 5.74m Partly glazed door and window to front, partly glazed door to rear ele4vations. Tiled floor. 2 radiators. Stairs to first floor. Door to stairs to basement. Window overlooking conservatory. Fitted kitchen with range of matching base and wall units including display unit. Electric oven and 4 ring gas hob with extractor over. Built-in slim-line dishwasher. Corner sink with mixer tap. Built-in fridge. Tiled worktops and splash-backs. Cupboard housing electrics.Conservatory 4.93 (max) x 3.92m Sliding patio doors to terrace. Windows to south elevation. Tiled floor. Radiator. Vent. Obscure glazed roof. Lounge 6.00 x 3.59m 2 radiators. Wood flooring. Window to front, east and south elevations. Marble fireplace. Coving and ceiling rose. Landing Wood flooring. Stairs to second floor. Window to south elevation. Dressing Room 2.31 x 1.95m Window to front elevation. Radiator. Wood flooring. Bedroom 2 6.00 x 3.80m Window to front, east and south elevations. Wood flooring. Radiator. Bathroom 3.55 x 2.19m Bath with tiled surround and mixer tap/shower fitment. WC. Tiled floor. Partly tiled walls. Window to south elevation. Radiator. Pedestal basin. Landing Wood flooring. Door to loft space. Bedroom 3 3.82 x 1.78m Sloping ceiling. Wood flooring. Radiator. Window to front and east elevations. Shower Room 2.70 x 2.05m Window to front elevation. Vanity unit. Wood flooring. WC. Shower. Sloping ceiling. Radiator. Room to Create Bedroom 4 5.00 x 3.67m (currently loft space). Window to front elevation. Wood flooring. VMC unit. (6.00 x 3.60m) Space and plumbing for washing machine. Door to outside via patio. Boiler. Oil storage tank. Double metal gates lead to tarmac drive and Car Port 8.13 x 4.56m. Log Store. Walled garden laid to lawn with mature trees, roses, wisteria etc. Terrace. Mains water, electricity and drainage. Oil fired central heating.